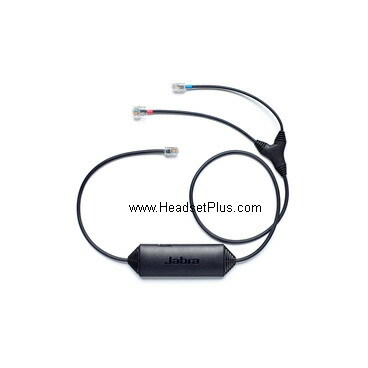 Jabra LINK 14201-33 enables remote Electronic Hook Switch Control (EHS) with Jabra wireless headsets and the Avaya Digital Deskphone series 1400, 9400, 9500, 9600. Jabra electronic hook switch (EHS) lets you to electronically answer and end calls, control volume and mute comments using controls built into your Jabra wireless headset (i.e. Jabra 920, Jabra 6470, Jabra 9470, Jabra 9450 GN 9330e, GN 9350e, GN 9125 or GN 9120 EHS model), while you are away from your desk phone. Now you can enjoy the benefits of “hands free” communications, without the restraints of phone cords. Be extra productive and take full advantage of wireless convenience from up to 300 feet away from your desk. Jabra LINK 14201-33 is software upgradable. Simply connect a standard Jabra cable to the computer via the USB port and download free software from www.jabra.com/pcsuite.